Knowing how to properly care for dentures is important to ensure longevity of the denture and the best care for the patient. Many patients are unaware of the maintenance required to keep a denture, and their mouth, in the best working condition. The two most common areas of concern are fit and hygiene. 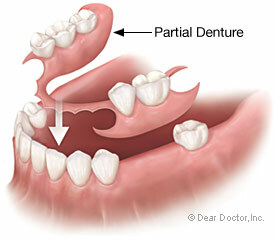 An ill-fitting full denture will wreak havoc on the gums, creating “hot spots” of wear. Not getting these hot spots addressed by the dentist typically leads to a poor quality of life for the patient due to the pain or the patient will typically not wear the denture, both are equally as bad for the patient. Pain + no teeth = not eating. Additionally, for partial dentures (where natural teeth still stay in the mouth and the denture fits around those existing teeth) a good fit is imperative to keeping the denture in good condition. 1) The partial denture has a better tendency to break if it is hitting another denture or surrounding teeth, and 2) as with a full denture, it can be painful for the patient. Avoid the tendency to sleep in either a full or partial denture. If a patient sleeps in a denture, the denture becomes loose after a few days. Fit is an important part of how to properly care for dentures. Sleeping in a denture is not a good idea also because of the effects that has on the overall hygiene of the mouth. The gums needs to breath and the denture needs to be cleaned. The best care for dentures is to take them out at night, remove any glue residue, use a denture brush to clean the denture entirely, and soak them in the recommended denture cleaning fluid. Follow these tips on how to properly care for dentures to maintain the investment made and keep a good quality of life. Author Dr. Owyoung Andrew Owyoung, DDS, has been providing comprehensive family dental care for 29 years to the Sacramento area. Widely considered a top dentist in Sacramento, the staff at Soft Touch Dentistry are equipped with the knowledge, experience, and equipment to deliver an unparalleled dental experience. Are You Ruining Your Teeth with These Bad Habits? Your favorite part of a frosty drink is chomping on the crunchy ice at the end. Stop! Chewing ice is just one bad habit that can ruin your teeth. There are times a dental condition is not the cause of a toothache. In fact, if you suffer from sinusitis, you're aware that when your nose is clogged your teeth can be painful. Here’s how to tell if it's sinus pressure, or something more. Millions of people around the country are unhappy with their smiles because they are unhappy with their teeth. Cosmetic dentistry offers a wide range of treatments that can help you get the smile you deserve. Are Genetics Affecting Your Oral Health? Much of your overall health is determined by your family history. Even some oral health conditions may be inherited. If you feel disheartened by your discolored and stained teeth and try to hide whenever you see a camera, veneers could be the option you’re looking for to restore your natural bright smile. Do you know the signs of gum disease? There are five obvious warning signs that your gums aren't healthy and could be causing your smile some serious damage. Find out what they are in our latest blog.